1 What size tent do I need? 2 How much will this cost me? These two questions are uppermost in most event planners minds. Good planning is important to the success of any event. The calculator on this page will give estimated costs of various types and styles of events. The prices shown are based on ASAP Tent and Party Rentals prices, installed in the Toronto area but are applicable in most major markets in North America. Figures shown are in Canadian dollars. To detemine USD multiply by .80. Prices in rural areas vary. 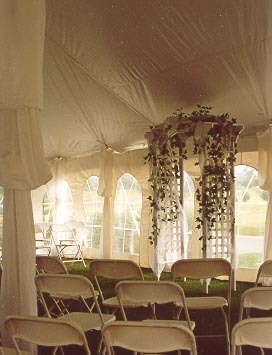 When tent prices are quoted it is based on installation on an unobtructed flat grass surface. Sq. Ft. Sq. Ft. Sq. Ft. Sq. Ft. Sq. Ft. Sq. Ft. Approximate package price including chairs, tables etc. The prices above are for estimating purposes only. To determine the current exact price or place an order on the net go to the ASAP Tent and Party Rentals Online Store Making your party "The Event to be Remembered" starts here at theASAP Rental Home Page. Also visit our Site Index for more information. Tips and links on a wide variety of topics from Wedding Ettiquette to making a speech. Subscribe to our Event Planning Newsletter to be kept up to date on the latest information.